Australia is hard to put a finger on – or even, understand. Sydney felt a bit like New York, a bit like London, and a bit like San Francisco. It is expensive, peninsular, and teeming with various cultures. The blocks in the central business district, and general center run north-south into a few fingers of land with the historic Rocks/Circular Quay area, the Opera House, and a fantastic botanical garden reaching out or yielding to the bay. Alleys here are on the rise to catch up to Melbourne’s advanced laneway culture. I met with architect/planner Craig Allchin, of Six Degrees, and now a consultant to the city of Sydney. He explained to me the formal history of the city, its latent problems, and how the mayor has recently taken a liking to laneways and begun catalyzing their habitation through various financial stiumuls programs, specifically one for the encouragement of small bars, which Craig refers to as “the cafes of the night”. These types of spaces are seriously lacking in many of the American cities I have looked at, especially Seattle. Craig began his alley affair with the opening of one of the first laneway bars in Melbourne (check the link above and find Meyer’s Place Bar) with five other recent architecture graduates a number of years ago. After the success of this, along with a few other factors, Melbourne has transformed into the most amazing collection of revitalized service lanes out of any other Western cities I have seen. It looks to set the bar high for a competitor. Last night, I paid a visit to small business of the year, Grasshopper, a fantastic two-level bar and restaurant off the tiny and sketchy looking Temperance Lane off George Street. This space used to be a printing press area and due to the new bar stimulating program, has taken off into a fantastic little place. I also visited Via Abercrombie in Abercrombie Lane, which was essentially what looked like a garbage room transformed by lining the walls with cabinets and placing a table in the middle into a very popular lunch-time sandwich spot. Both of these places were fantastic to sit in and see the engagement with the laneway, and the city fabric itself. These places were very uncharacteristic of the otherwise service-oriented lanes throughout the city. I see a parallel in Sydney to the Seattle alley cause, as they are trying to transform something that has been utilitarian into something that aspires to be more. The city’s acceptance of Craig’s ideas and the successes of Melbourne is very encouraging to the Seattle future. These types of spaces really begin to add an entirely new layer to the perception and attractiveness of a downtown. We have endless potential – off to Melbourne! One of the most interesting aspects of cities is their texture -culturally and physically. I have begun to notice tiny places throughout the alleys and the city in general where the natural world has crept up, on, and into our paths and begun another series of layers over our existence. The edge of urbanity blurs at these points of reclamation. One of my recent favorite instances if this can be found halfway down a pioneer square alley where flowering weeds have found their way into a wall and onto a window sill. This should serve as a model for our continual development of cities. We should allow, assist, and design for new ways that we can coexist with ecological forces so often pushed behind increased returns on investments, efficiencies, etc. Photo credit goes to Karann MacNealy on the Jane’s walk a couple weekends ago. You can check out this simple welding project that is assisting in this reclamation process off University between 1st and 2nd. It contains some sedums often used for green roofs and continues to flourish. 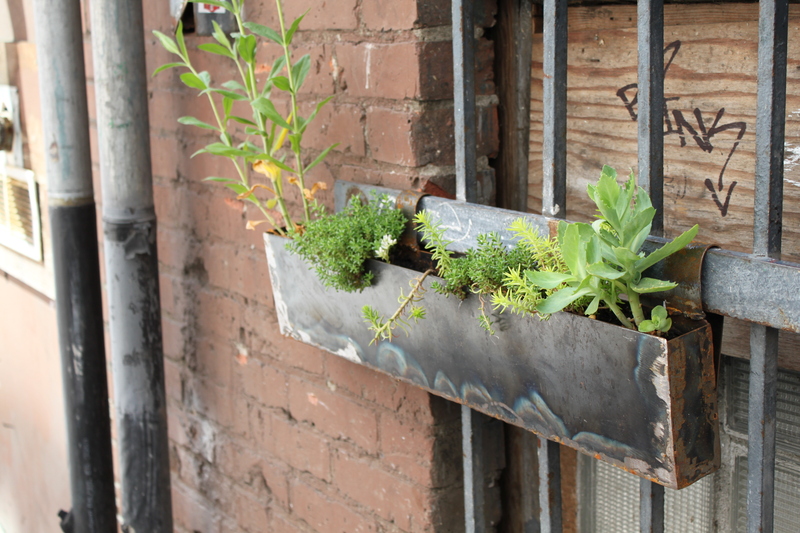 I encourage everyone to plant something in between bricks, under a downspout, on a window sill, or anywhere that will benefit an alley near you. What is now considered a lifeless byproduct of urban efficiency can now be a place for environmental benefit and growth. Thank you everyone for coming! It was awesome to see more than one other person, pigeon, or rat walking around in there this weekend! Our walk lasted for two hours and brought some interesting things to light. We moved from the Moore all the way to Maynard and Canton Alleys where we got to go in and speak with the owner of Sun May, who gave us a brief history lesson on the two alleys. Apparently they were live/work and the first two major blocks in the area. This could explain their having commercial space on three sides instead of just two. There were many great questions asked and a lot of new things discovered. I would like to thank Lisa Quinn of Feet First and Todd Vogel of the International Sustainability Institute for opening their office n on a weekend to talk about their great space and initiatives. I would encourage everyone who attended the tour to tell their friends to walk through the alleys, imagine what they could be, plant things, and keep an eye on them. The city needs to look at them as pedestrian assets more and more until they are capable of turning them into just that. There is a lot of character, potential, and history within these spaces – we only need to bring them to the attention of everyone. Thanks to Heidi Oien for giving me the idea to do this and thanks to everyone who came out. Thanks also to Karann MacNealy, Animish Kudalkar, and Max Foley for taking photos along the way. I will be posting information shortly on a volunteer group that is gathering to paint and clean Maynard and Canton alleys in hopes that they can be returned to a great commercial and pedestrian area – so stay tuned. I was invited to lead a walk in honor of late famed urbanite Jane Jacobs next Sunday, May 2nd, due to my love for the dark caverns of our city. The walk will showcase some of my favorite nooks and crannies throughout some of the alleys in Belltown, Downtown, Pioneer Square, and the International District. We will be meeting at the back of the Moore Theater at 12 noon, one of the most sculptural alleys we have, and will end next to the Wing Luke. Come see some interesting spaces that you might walk by everyday and never notice! A couple weeks ago, I had one of my best alley outings yet. A friend of mine took me to the International District to see Canton and Maynard Alley, the only two alleys I have discovered in the city thus far that have their own names. Both alleys are a block apart and incredible. About midway down the buildings that border these alleys, storefronts and large windows create actual alley facades. It appears as if these buildings were designed to have programs that would engage the alleys, and apparently continue to do so. Maynard Alley is home to the fantastic Liem’s Pet Shop and the somberly legendary Wah Mee Club. Upon entering Liem’s store, you feel as if you are in a different city, and perhaps even a different time. Bubbles, tubes, blinking lights and flitting fish are everywhere in a cavernous shop with a friendly automated “welcome” voice that greets you upon entry before you can say hello to the talkative and kindly Mr. Liem. This is literally one of Seattle alleys’ monuments. The shop presses far into the building and the owner informs me it used to be a noodle factory. Canton Alley faces the new Wing Luke Museum which has some great photos hanging of what the place used to be like. There will be much to explore with these two spaces. They appear to be loaded with a lot more recorded culture than their downtown counterparts. 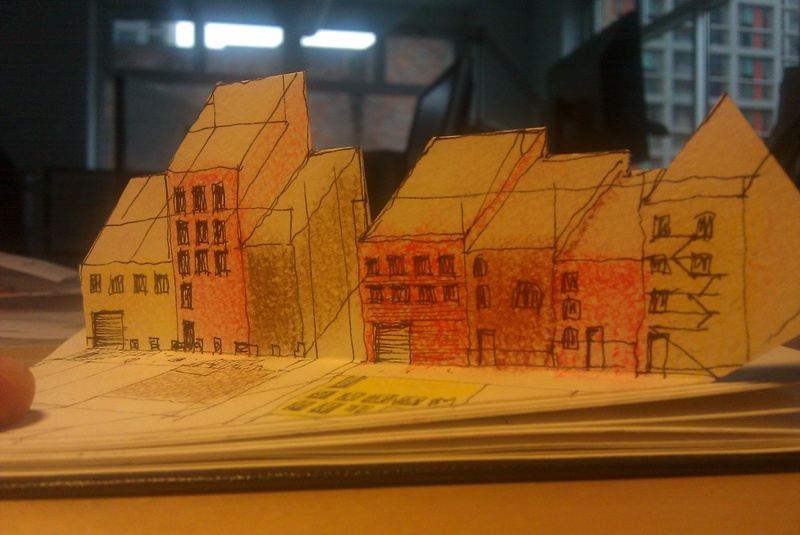 This weekend, I began to take some ideas for drawing and sketch documentation into analysis. This approach looks at the drawing as a machine, where by doing it, it does more than a photograph or a memory on some level. This method seeks to record planimetric information, elevation, apetures, existing structures, and with a few cuts, perspectival relationships. I am really excited about the possiblities for this. This work was inspired by a book on Dali and Escher, as well as unfolded architectural drawing styles. I also took a walk up two alleys I am considering for a sort of theoretical masterplan study. The alleys between 1st, 2nd, and 3rd run almost completely unobstructed to the Seattle Center beginning just across the street from SAM and Benaroya Hall. 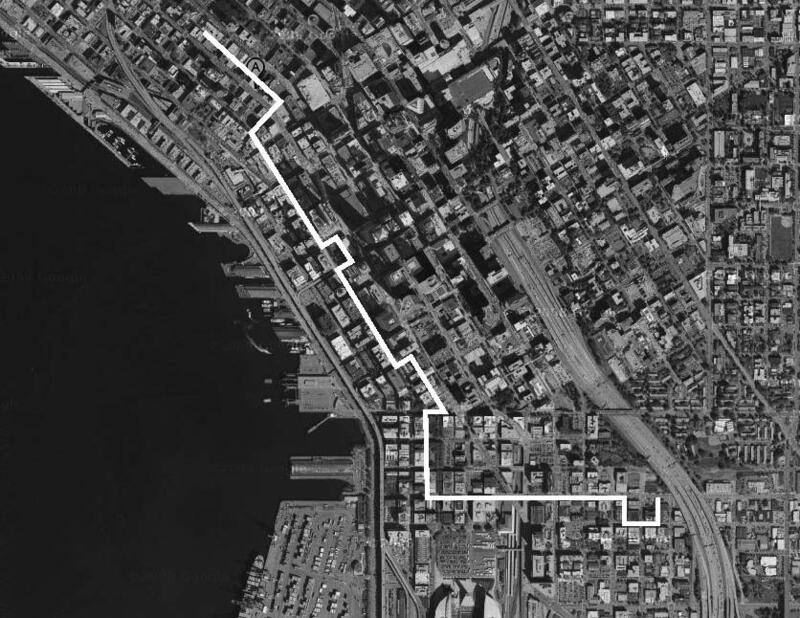 These spaces run through the market area, through the crank in the grid, through the nightlife of Belltown, and through the more marginalized areas. The security and safety one feels diminishes the further north one goes. These alleys could literally stitch these fragments together. There are plenty of interesting conditions along these two paths that warrant reconsideration. I will post some collages soon on some of the hidden treasures that border both. AIA Seattle is pleased to award its 2010 Emerging Professionals Travel Scholarship to Daniel Toole Assoc. 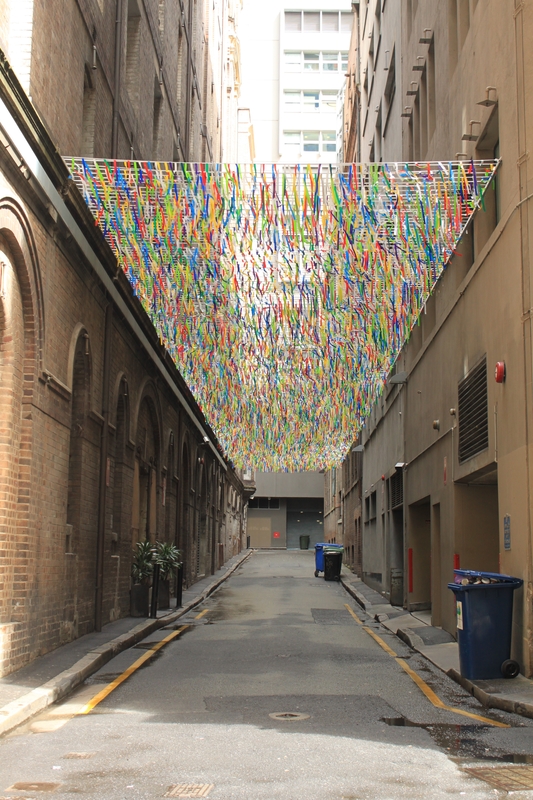 AIA for his proposal to study the future of our downtown alleyways as new public spaces. His research will include the study of alleys in San Francisco and Melbourne, Australia, where he will sketch, photograph, interview, blog, and record his impressions of vibrant alleyways that work. Daniel will receive $5,000 to complete his proposed travel and research and will present his research at an exhibition at AIA Seattle’s gallery in Spring 2011. The AIA Seattle Emerging Professionals Travel Scholarship expands the experience and opportunities of young professionals, encourages cross-cultural dialogue in the profession, and shares knowledge from architecture practice around the globe with members in Puget Sound. I am extremely excited to have won this years Emerging Professionals Scholarship and will use this blog to chart my progress in travels and local exploration of the alleys. I plan to begin my travels in the latter part of the summer this year. I will try to post at least once a week until then with various articles, sketches, research, and experiments that pertain to making our alleys the newest addition to Seattle’s urban public space network. I would like to thank AIA Seattle and the Honors and Fellows Committee for their generous gift. This scholarship will allow us to learn from other major global cities, as well as create a cultural link between the newly developed laneways of Melbourne and the historically rich alleys of Japan. Please visit this site with thoughts and comments often. This will be much more exciting with your interaction and opinions. These are your alleys. Acting as a tour guide this weekend to my mother visiting from Portland, we found some very interesting situations in the alley network. The Arctic Club, one of my favorite buildings in the city, seems to have blocked off and embellished its alley with a lovely oyster tile no doubt to secure it as a back of house area and the conveyance of food, drink, and waste in a classy manner. You can climb up on top of the parking structure at 4th and Cherry and look down into this space. Imagine it converted into a gallery or glass-roofed greenhouse addition to the hotel. There is a party wall to the north that would need to be opened. Also, one of my favorite alley-type spots behind the pioneer building begs to be looked at. It is almost always gated and I think acts as an entry for the office buildings that flank it. It’s viewable from the alley or the street. It’s amazing to see what brick and greenery can do to a tight urban space. I do however, wish this space wasn’t gated. It’s on the west side of 2nd between James and Cherry. If anyone knows more about it, please fill me in. Fifty percent of this alley is old building stock complete with a massive beautiful fire escape and disconnected downspouts leaking stormwater onto bricks. Moss has begun to grow where the misguided water flows. The northern half of the alley is bound by a low parking structure to the west and a large, flat-fronted tower podium to the east. The parking structure offers a perfect study area for an alley oriented facade study. I am pursuing various mediums at the moment on how to document and design within the alleys. Last night I tried built frame, a panoramic technique that lends itself well to documenting tight spaces. Depending on the size of the photos, one can almost be within the subject space due to the movement of the eye around the physically flat medium. I plan to collage drawing and painting over the tops of these first.